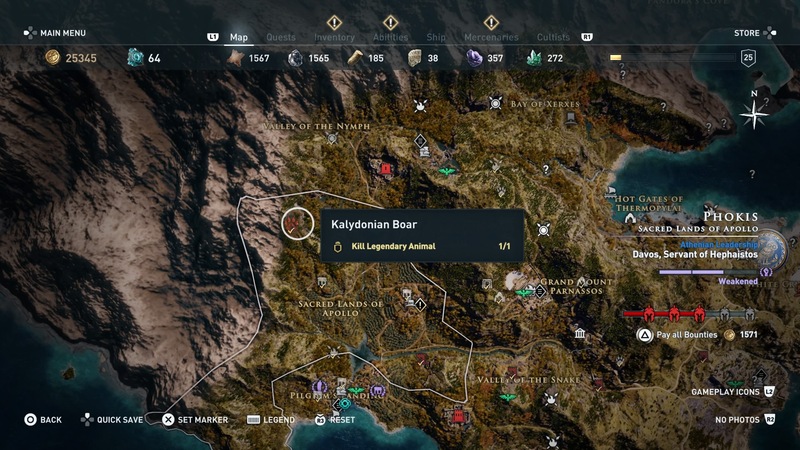 Assassin’s Creed Odyssey grounds the myth and legend of Ancient Greece in a stunning world – and what is a world without beautiful and diverse fauna? Gaia is no push over though, so we’ve put together this guide to help you tackle some of Mother Nature’s toughest beasts. 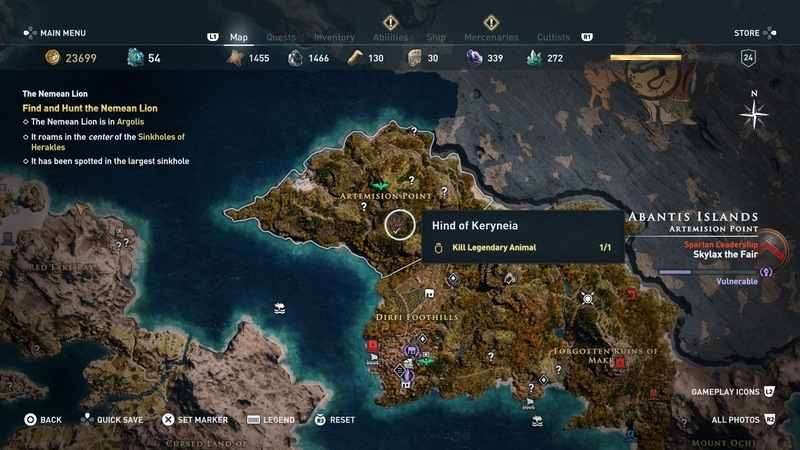 Here’s how to complete the Daughters of Artemis quest and kill the Kalydonian Boar, Hind of Keryneia and the Nemean Lion. The Daughters of Artemis quest is available from when you first reach Phokis, but you might have some trouble finishing it before you level up and get some better gear. These beasts are some of the most difficult enemies in all of Assassin’s Creed Odyssey – so be warned. To start the quest speak to Daphnae at the Temple of Artemis in the northwest of Phokis. It’s in the northeastern part of the Sacred Lands of Apollo. Daphnae is also a romance character, so check out our Assassin’s Creed Odyssey romance guide if you need help with that side of things. Even when they’re not super-charged to the max, boars are low key one of the hardest enemies to fight in all of the Greek World. The Kalydonian Boar is even more so. It has an absolute mountain of health, and hits like a runaway train. In the first phase of the fight, the Kalydonian Boar will attack you just as a normal enemy boar would, but when you’ve dealt enough damage to it, the boar will back off and summon a charge of four helper boars to rush you. In the first phase of the fight, make use of your dodge ability. 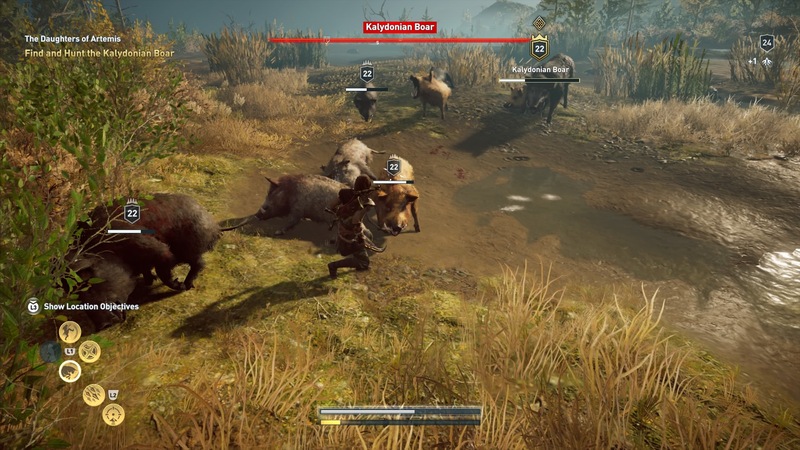 Timing perfect dodges will allow you to get behind the Kalydonian Boar and land a few free hits. If you don’t slow time with a perfect dodge, try to roll into and past the boar’s oncoming attacks – so you end up next to its back legs. If you stay locked on by clicking in the right stick on a controller, you should be able to land a couple of hits before it whips around to knock you back. Don’t get greedy once you have an opening though, if you stick around and attack for too long, the boar will hit you for big damage. Overpower attacks are strong against the boar, because you can activate them during one of its attacks to avoid getting hit. Since Adrenaline abilities restore your health too, use them sparingly when you’re at full health and save the meter for when you need healing. Once the boar backs off after you’ve dealt a chunk of damage, immediately look around for the incoming charge of four boars. This happens multiple times throughout the fight and is difficult to deal with. The small boars have the potential to rip through your health bar almost as quickly as the big boi, so focus your attention on them while the you have the chance. Be careful of their charge move, because it’ll still hit you during your dodge roll – so make sure you move out of their path when they come at you. Try to get behind them as you would with the main boar, but be very careful of others charging you while you’re engaging another. If you have the “Flaming Attacks” ability, try to use it when you can – the chip damage from fire is useful, especially against the smaller boars. Once you’ve taken out the helpers, return your focus back to the Kalydonian Boar – rinse and repeat. When you’ve claimed the boar’s pelt, return to Daphnae for your prize: Artemis’s Bow – which gives +6% to your charging speed and a 20% boost to your Predator Shot power. We rate it as one of the best early/mid-game weapons in Assassin’s Creed Odyssey. To hunt down the Hind of Keryneia, journey over to the Spartan controlled island of Euboea. In the northwest of the island, towards the south side of Artemision Point, you’ll find the hind. This is an easier fight than the Kalydonian Boar, but the Hind of Keryneia still has an absolute ton of health. This fight goes the distance, and the toughest thing to do here is keep focus for the whole time. The Hind of Keryneia will charge at you with its antlers and sweep them around if you get too close. The hind’s antlers have a large reach, and getting hit by even the sides will deal a big wodge of damage to you. The key to this fight is staying way away from those golden antlers with your dodge roll. Roll past the hind’s attack to get towards its back legs, then let loose. Back off before if fully turns though, or you’ll get spiked. Repeat this, while also peppering it with adrenaline skills to weaken it and replenish your health, until the hind is defeated. Frontal attacks aren’t great against the Hind of Keryneia, because it has a powerful move where it pins you to the ground with its antlers. If you can trigger this attack and dodge it though, the Hind will get stuck in the mud – so this can make for a good high risk, high reward strategy. If you do try that method, beware that the hitbox for the pin move can be unpredictable and catch you when you’re not expecting it to. Sometimes the hind will run away and hang back when you’ve done enough damage to it. Use these opportunities to land headshots with your bow. Once the hind falls, take the pelt back to Daphnae for a reward of Death Arrows. 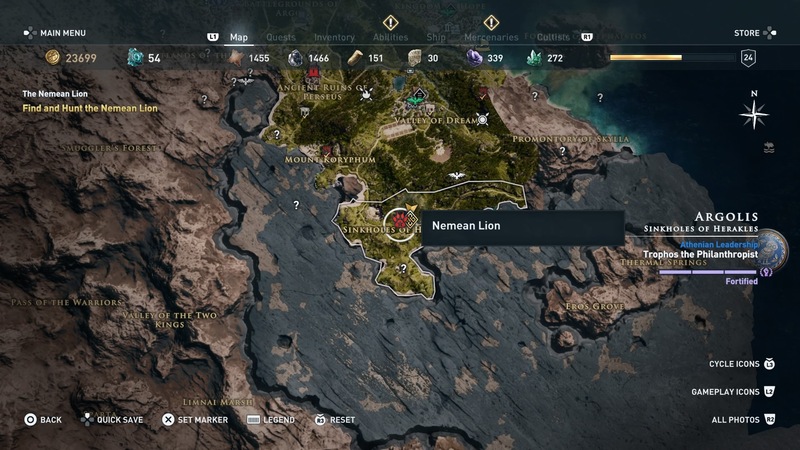 The Nemean Lion fight is a cross between the hind and boar fights you’ve done so far. Use the other lions in the arena to build up adrenaline, while dodging the main enemies fast and powerful attacks. The basic mechanics of this fight are the same as the other two. Dodge into and past the Nemean Lion’s incoming attacks so you’re level with its back legs, chip away, then fall back. Don’t try shooting arrows from up high on the walls of the arena – they don’t work. This fight is intense, but shouldn’t give you a huge amount of trouble if you’ve come through the other challenges. The hardest part is that the lion’s pounce attacks can be very unpredictable – changing direction on coming at you very, very quickly. The lion is quite vulnerable to headshots, so pop it with a few if some distance open up between you – but be ready to dodge, it can close that distance in a flash. Manage your adrenaline so you can heal yourself when you need it, and stick with the war of attrition until the Nemean Lion is down for the count. Now that you’ve got its pelt, return to Daphnae and claim Pandora’s Kopis – a powerful legendary weapon that deals +15% damage to animals and gives huge buff to the Tamed Beasts ability.